Some of us think that garden care is not a task for the winter but this isn’t necessarily the case. Winter is actually the best time for larger scale yard activities like tree removal. If you have major pruning to perform then wintertime is a great time to get it done as well. When your trees are in peak summer shape (although they’re beautiful), it obstructs their natural structure. You want to ensure that you are removing all unwanted branches and deadwood, so a tree without leaves makes tree trimming easier to perform properly. 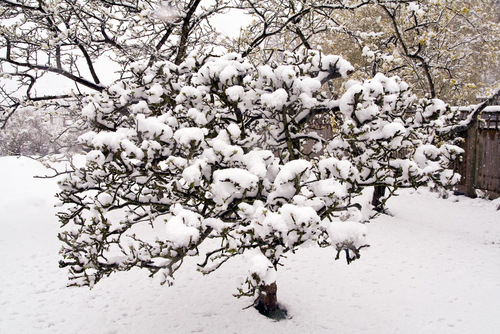 Did you know pruning trees in the winter allow them to recover faster? Cool right? Pruning in the winter gives a tree ample time to recuperate during the spring months. In other words Springtime accentuates fresh growth which allows for optimal recovery time. Sometimes when a tree has maintenance performed it has a temporary effect on its beauty. Winter makes for good recovery time because we spend most of our times indoors. This gives the tree time to repair and regrow its canopy for the spring. When you have a dead tree or dead branches, it usually comes hand in hand with infestation of bacteria or fungus which can also play host to parasites, insects, and rodents. During the winter, these pests and problems are usually dormant. They are in a state of stasis and do not spread their diseases or start breeding and laying eggs. There will be fewer problems with these pests during the rest of the year if we only disturb them in the winter months. Diseases such as Dutch elm disease, cedar hawthorn rust or fire blight are not likely to disperse to other vegetation during the winter. Winter is the time for more extreme weather and dead and dying trees and branches in your garden are dangerous. Removing these dead branches in the winter will ensure that the rest of your garden and property is safer. Trees will also be healthier without all that dead wood that could snap under the weight of snow and ice. You can rest easy knowing that there is less potential for your pets or children to be injured playing in your garden this winter. Winter is the ideal time to prune your trees and have any significant work done that your trees require. Diseases are dormant, you will be able to see the full structure of the tree and you will not find yourself staring at ugly pruning for very long! You can also be reassured that your tree and landscaping in Frederick, Md. needs are met and your property will be much safer without any dead wood to worry about. It might not be the most appealing time of year to be outside but if you wrap up warm and have the right equipment, your garden will be all the more healthy due to your efforts when winter is over.